The oldest temple in Bangkok pre-dates the city itself and was originally founded in the seventh century with the name Wat Phodharam. Before there was a temple, the site was a school for traditional medicine and this legacy continues today with Wat Pho renowned as one of the most important centres in Thailand for traditional medicine, particularly Thai massage. Under King Rama I, the temple was restored and enlarged and in 1801 it was renamed Wat Phra Chetuphon which is the name many Thai people tend to use rather than Wat Pho. The main bot of the temple houses a seated Buddha image known as Phra Buddha Deva Patimakorn which sits on top of a three-tiered pedestal under which some of the ashes of Rama I are still kept. During the reign of Rama III, the temple underwent further restoration and construction. 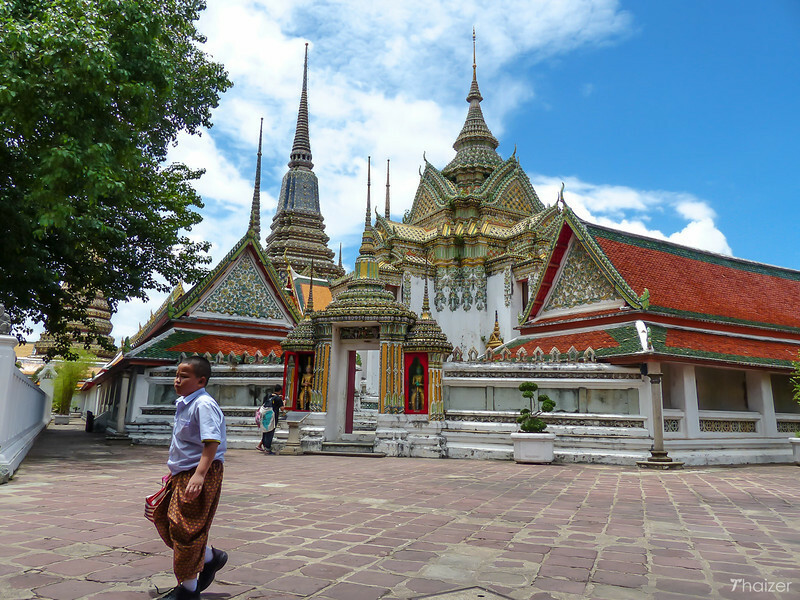 At this time the temple was established as a centre for learning and Wat Pho is often referred to as Thailand’s first university. In 1832, the chapel of the Reclining Buddha was built and it is this magnificent Buddha image which is the main attraction for many of the local and overseas tourists visiting the temple. The statue, which is made of plaster bricks and gilded in gold, features the Buddha in a reclining position which is the pose depicted at the time of the Buddha’s death when he entered Nirvana. The statue is 46 metres long and takes up virtually all of the viharn (chapel) which houses the image. The face is 15 metres high whilst each foot of the statue is 3 metres high and 5 metres long. 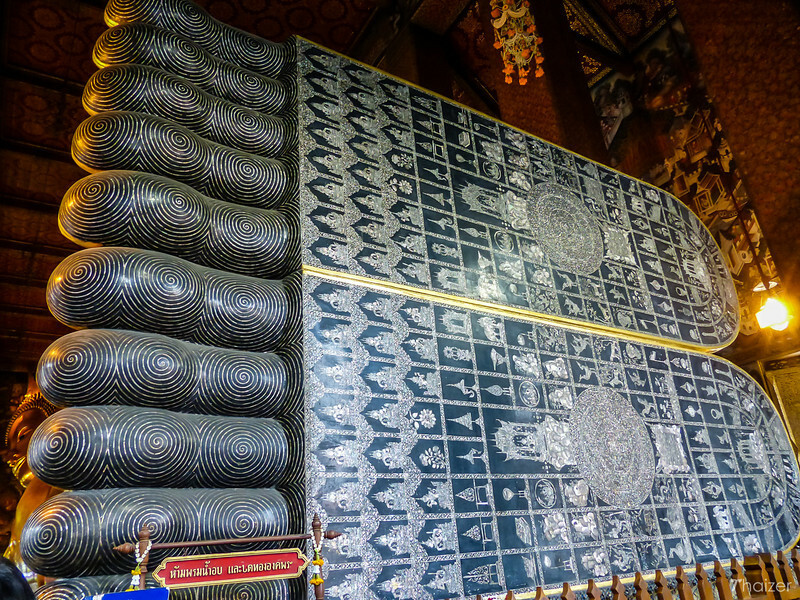 The soles of the feet are inlaid with mother-of-pearl which depict the 108 auspicious signs of the Buddha. 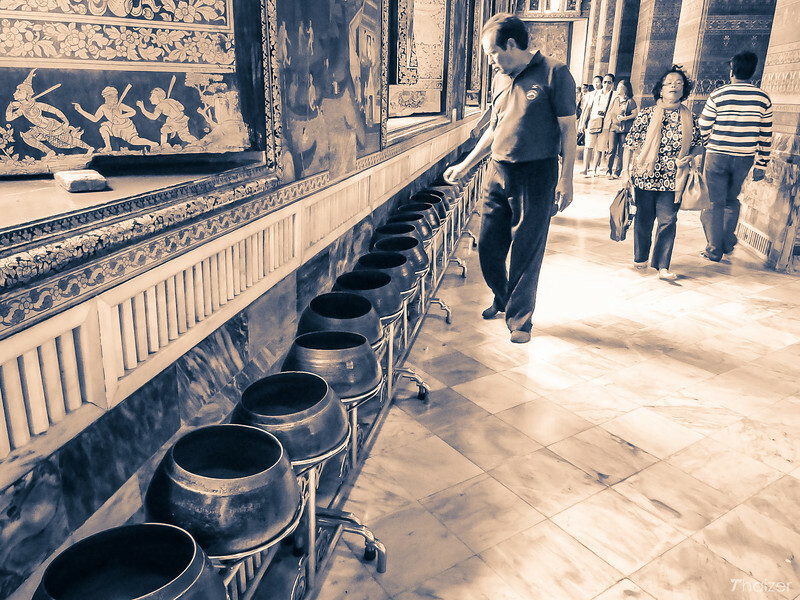 Running alongside the wall of the viharn are 108 bowls which are said to bring good luck and long life if you place a coin in each. 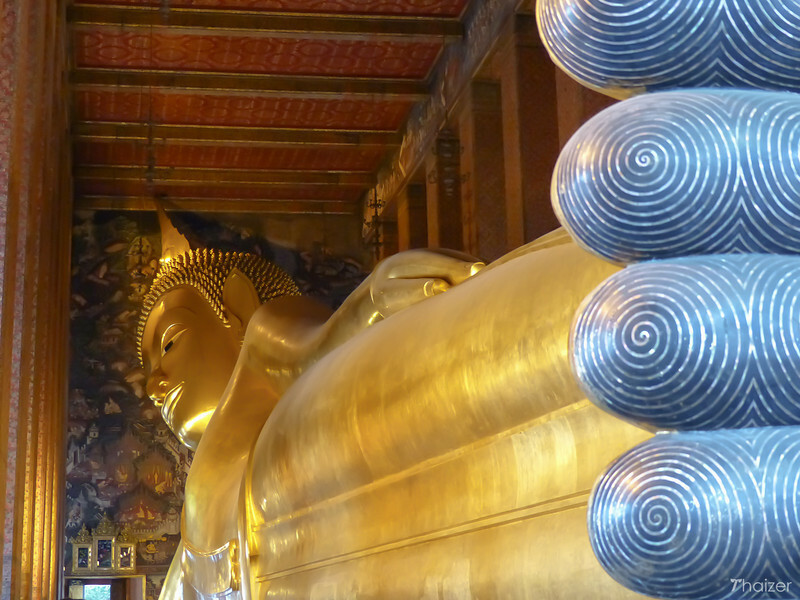 Wat Pho is considered by many as the place to go for a traditional Thai massage. The massage is carried out in covered pavilions and owing to the popularity of the service you might not be seen immediately. I had a foot massage here some years ago which I remember as being very good, but also very firm. A traditional Thai body or foot massage can be uncomfortable at the time, but is said to have long term benefits. The massage centre is open daily from 08.00-18.00 with the current cost of a 1 hour traditional Thai massage approximately 300-350 Baht 420 Baht or 260 Baht for 30 minutes. A foot massage is 420 Baht for 1 hour or 280 Baht for 30 minutes (prices checked June 2013). From January 1, 2019, the price for entry for non-Thais will be 200 Baht (free for Thai people).